“Everyone deserves to surf privately online if they want to.” Those are the words of Opera’s Vice President of Marketing, Steve Kelly. And, trust us, that belief shines through the company’s one of a kind service. Free for all, the Opera browser comes with a built-in VPN. Better yet, it’s exceptionally fast and has a built-in ad blocker for good measure. So, it’s free and it’s fast, but what else? Well, after acquiring Canadian VPN service SurfEasy last year, Opera has servers in 5 locations including the US. 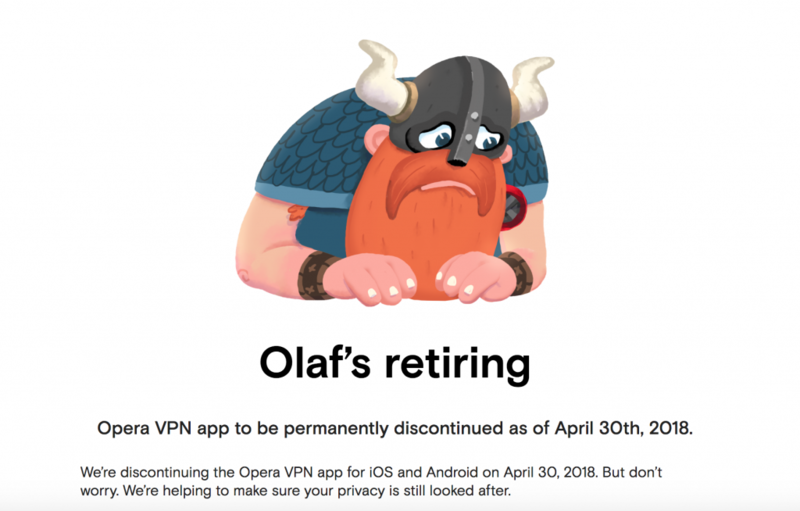 There used to be an Opera VPN mobile app but they discontinued it this year. Instead, the web browser is available on mobile devices as Opera Mini. 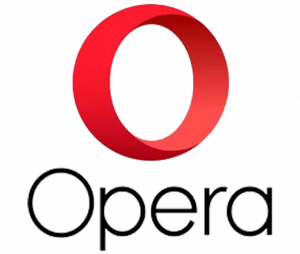 Opera Mini is one of the world’s most popular and effective mobile browsers with more than 300 million users worldwide. Plus, it also comes with a built-in ad blocker, news feed, and data savings. Opera Mini is available on Android, iOS, and basic phones. Coming back to the Opera browser. The software is available for Windows, Mac, and Linux users. The browser is intuitive, stylish, and packed with features. It comes with visual bookmarks, a battery saver feature, and a live currency converter for shopping online. You can choose from more than 1,000 extensions and themes to customize your browser. Additionally, you can pick up your browsing where you left off whether you’re on your mobile or on your computer thanks to the software’s ability to sync browsing data. All this coupled with the fact that Opera comes with 256-bit encryption means that users can enjoy fast, free, and secure browsing. Everything about Opera is fast. In fact, it’s among the most impressive on the market, especially considering the service is free of charge. Downloading the Opera browser was quick and easy. The process took less than 5 minutes from the moment we landed on the service page to the moment we used the browser. Once downloaded, we tested our internet speed using first while on Google Chrome and then from the Opera browser. Using Google Chrome, the internet was 23% faster than my host average. 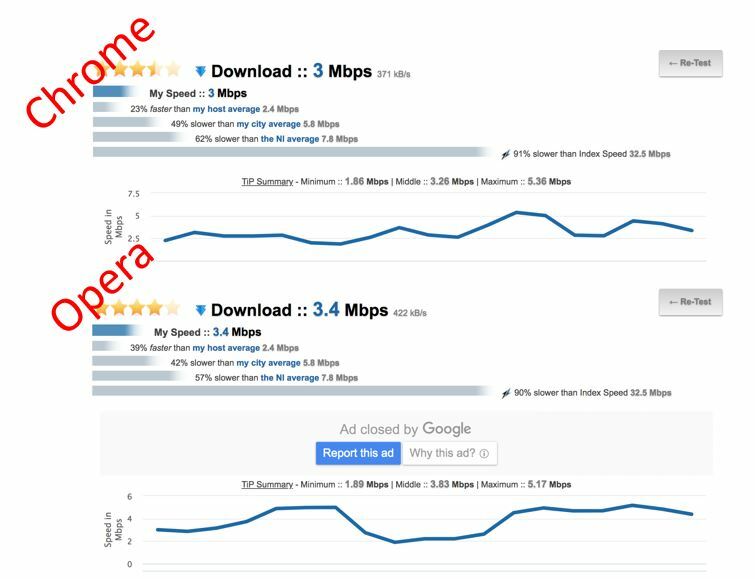 With Opera, the internet was 39% faster than my host average. Unfortunately, you can’t choose the specific server, just the continent. The VPN server locations are great but, they’re missing one, the UK. With this in mind, you can’t enjoy the likes of BBC iPlayer or Channel 4 On Demand. When it comes to geo-spoofing, Opera has a good thing going. Google DNS servers located in the same country as the VPN server perform the DNS resolution. This means that if you connect to a Dutch VPN server a Dutch DNS server performs the DNS resolution as well. Simply put, your DNS requests will come from Opera rather than your real IP address. We researched any IP and DNS leaks but found no reports. When it comes to user experience, Opera is one of the easiest to download and use. In fact, Opera has gone above and beyond when it comes to design. The browser is stylish, intuitive, and a pleasure to maneuver. We used an Apple MacBook to test the browser. With a Mac, all you have to do is download the browser and open it. Then, go to Preferences and enable the VPN. You can also enable the ad-blocker to get rid of annoying ads. The VPN then connects to websites via various servers around the world. While the browser does warn you that by enabling the VPN the connection can become slower, we didn’t see much difference. Enabled or not, the browser performs quickly. When it comes to browsing, the big question is, can Opera bypass the Great Firewall of China? Unfortunately, the answer is no. In April 2016, there were reports of the VPN browser working in Southern China. Since then, the country blocked Opera. Additionally, Netflix users can’t view content that isn’t available in their country and the BBC iPlayer is able to block OperaVPN users from accessing their shows if you are not in the US. When it comes to security, there is little to no information. We were able to see that Opera uses AES-256 encryption. While this is good, it doesn’t tell us much. There are exceptions though. SurfEasy clients may use in-app analytics like Google Analytics which collects all kinds of data with regard to your online behavior and habits. But, how much of this applies to the Opera VPN? After all, SurfEasy is Canadian. Opera is Norwegian and Norway does perform some surveillance. The country also cooperates with the NSA. But, that’s not our biggest concern! Both Canada and Norway are part of the Five (9/14) Eyes. Which means that they will share information with the other governments should they receive an official request. This doesn’t bode well for a VPN that can’t bypass VPN blocks, if they don’t have top-notch security what do they have going for them? When it comes to support and customer service, there are few options to choose from. Frankly, the browser is so intuitive that the company doesn’t need much in the way of customer support. The company has a “contact us” page with individual office phone numbers as well as some email addresses. You can ask any questions and receive support from Opera and Opera users on the Opera Forums. Additionally, the company has Help pages and a Bug Report Wizard on the browser itself. Opera is 100% free of charge. There are no trial periods or hidden fees. Also, you can download the browser and use it without ever sharing your bank details. For a free browser, Opera is impressive. It has no data limits, and above all, it’s faster than some of the paid VPN options currently available. The Opera browser is great for those wanting to geo spoof their location and protect their browsing while on a public Wifi.